What is silver cutlery worth? The age of dinner parties and formal dining at home may not be as popular as it once was. However, services of silver cutlery (also known as flatware) are much in demand. Some services can sell for over £10,000 and most 12 place setting services are worth many £1000’s. Even if you have an odd selection of silver cutlery it might be worth £100’s. 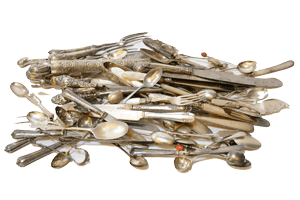 If you have a service of flatware or collection of silver cutlery that you would like to sell or have valued then we can help. This guide will act as a good starting point, helping you understand what to look for and why prices can vary so much. The first and most important matter is to understand if you silver cutlery is indeed sterling silver or if it is silver plate. Silver plated flatware or cutlery is very low in value no matter what the quality or quantity. If you don’t know whether or not your service is made of sterling silver you can learn how to read a hallmark here. You can also email images of the marks on your silver cutlery and we will be happy to advise you. A full service or just a few odd pieces? 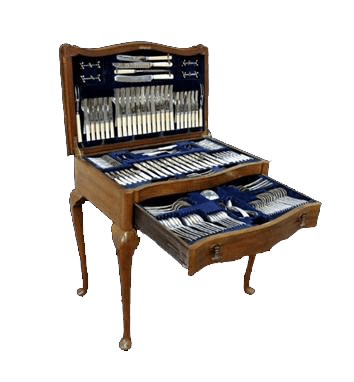 However, even an odd collection of silver cutlery can have a high value as long as it is made from sterling silver. Broadly speaking the older the service the rarer it is to remain as a straight service. The number of place settings is the next factor to look for. To be considered a service the general rule the minimum number of place settings is 6. 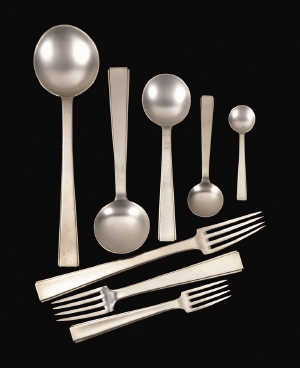 The most valuable canteens of silver flatware have 12 or higher place settings. It is very rare to find a place setting greater than 12 that is a straight service. As such if you have a 24 place setting which is a straight service it will command a considerable premium. 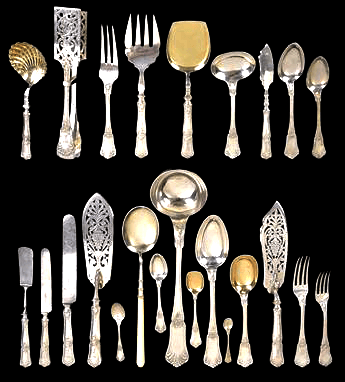 A basic service of silver cutlery may only contain a table fork, table knife and dessert spoon. However, some services contain up to 20 items per place setting and are much more sought after. Generally speaking the more varied the items the higher the value. Fish knives and forks are not very sought after but if they have silver blades and tines they will add considerable value to the service. The weight of the service is also important as silver has an intrinsic value in itself. We ask for the weight so we can ascertain the quality or gauge of the items. Some table forks may weigh as little as 50g, some may weigh over 400g. If you can provide a weight of just one item then we would ask for the weight of the table fork as this is normally the heaviest item. Technically a canteen is a container for a service of silver flatware or silver cutlery. If your service of silver cutlery is contained within a canteen then it may add a slight premium depending on the quality of the canteen. You can always provide an image of the canteen for us to asses if you like. A canteen on legs is not as sought after as a canteen which has not legs (like in the above image) and as such command a premium. You may think your service has bone handles or plastic handles, but it is most probable they are ivory. This becomes problematic as there is an imminent ban on the sale of ALL ivory within the UK. To check if yours are ivory or bone take a very close look at the handles. Bone handles will have lots of very small holes covering the surface (this is where the capillaries were). Ivory will be a perfectly smooth surface. Once all of the above factors have been taken into account the condition of the flatware must be examined. The most important items to look at are the forks. 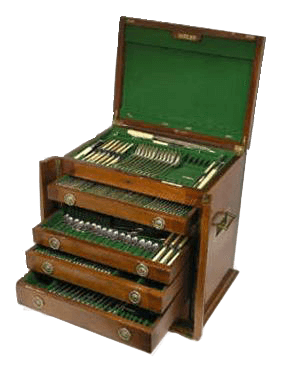 The tines should be level and even – if they have been used excessively then the tines may appear on an angle and this is not good news unfortunately as they cannot be restored. Engraved crests are usually seen in good light, but engraved initials normally have a detrimental affect on value. Auction houses typically charge the seller 20% commission and the buyer 25% commission. This means you only get back 55% of what the buyer was prepared to pay. We only charge 10% commission if we sell it privately. This means you get back 90% of what the buyer was prepared to pay. If you would like a free, no obligation valuation of your silver cutlery please use the form below.